Strainers, sight glasses, and non-freeze valves used in the steam trap periphery. For visually monitoring the flow of fluids from the outside of the piping. Strainers, sight glasses, and a variety of other products ancillary to steam traps and other valves. 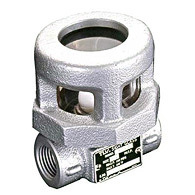 Strainer: protects equipment by removing scale and foreign matter from steam traps, reducing valves, control valves, etc.